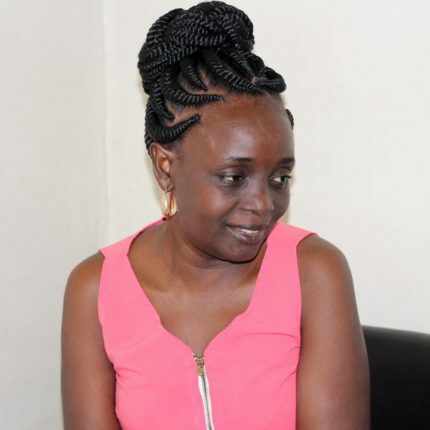 At first glance, Rose Atieno Auma could pass as your ordinary middle class girl in Mombasa city. The untold story is that her life depends on blood transfusion. “In the month of February 2019, I was transfused 10 units of blood following a serious health crisis; I was hospitalized for 2 weeks, five days, until I came back to life”. The 45 year old lady says she was diagnosed with sickle cell anemia when she was 5 years of age. Her parents struggled with her. Her basic education was very disruptive and it was only by chance that she was able to complete her primary school education. “I did not go beyond go beyond class 8. Besides I did not perform well because most of the time I was out of school due to my condition”, Rose quips. Rose Atieno Auma, a blood recipient, during an interview with this writer in Mombasa. She says her condition makes her feel tired; “walking just a few meters at times is like climbing a mountain”. For a long time she was treated for anemia, which was a serious misdiagnosis. The sickle cell disease was discovered much later. She started complaining of joint pains and painful ribs. “At that point I was being transfused 2-3 units of blood regularly, amazingly once I got transfused I would immediately come back to life” she further explains to the writer. She says when her hemoglobin is low her skin color turns into pale, her eyes also turn yellow, her appetite hits rock-bottom. “I behave like a pregnant woman with constant temper flare ups and mood swings”. She says the unfortunate thing is that quite a few people in the coastal region understand what sickle cell disease is. “I get sickle cell crisis every 2 to 3 months, normally it happens when my hemoglobin level gets to 4. This has made me completely rely on blood transfusion; I am transfused every 2 months”, she noted. She says this condition is very expensive to treat saying the government should consider providing subsidies to sickle cell patients through the National Health Insurance. “The last time I was admitted at MEWA community hospital in Majengo Mombasa, I paid a bill of Ksh. 300,000”, Rose says. Before she knew about the Kenya National Blood Transfusion Service she used to look for blood donors to donate for her. “Getting a blood donor is like hell because people do not like to be tested”, says the single lady. She later started mobilizing blood donors from her neighborhood, including friends and other volunteers, to donate blood for her. “The day I learnt of the Kenya National Blood Transfusion Service was a game changer for me. The organization has been so good, they have been so helpful”. She says she can now get her A+ blood type on a regular basis. She has since gained membership of various support groups namely Sickle Cell Warriors, Even Flo Africa, West Kenya SCD and Mombasa Sickle Cell Warriors. “If you get one man to live with you, he must be an angel”, quips the lady who works as a boutique attendant in Mombasa city. Rose says her message to blood donors is that everyone should donate blood because people are suffering. “Do not wait until you are threatened by circumstances or when your relative needs blood to donate; do it now to save a life.” she says. My name is Asha M. Dafalla, A wife and a mother of three children. I am a community worker at Lavie Foundation, Nairobi. I first donated blood in 1981 when I was in Form 3, I lost consciousness after the blood donation and this kept me away from donating blood again until 1986. 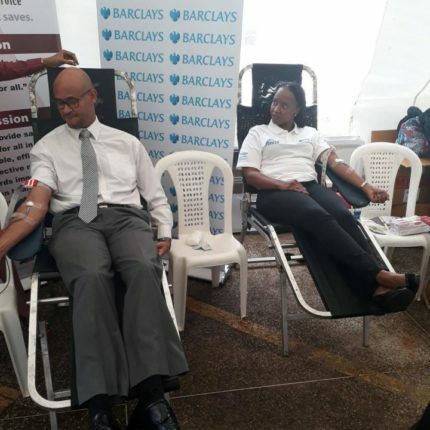 My friend and colleague back then, Madam Leah, requested me to accompany her to Mater hospital to donate blood for her brother who had been involved in an accident. My second donation experience was good and it opened my eyes on the importance of blood donation. I have been donating blood regularly since then, starting with once a year, twice and now am at three times a year. I have taken regular breaks when I am expectant and during breastfeeding periods. Donating blood makes me feel good knowing that I have saved lives with a priceless commodity, it gives me great satisfaction. I got enrolled to the Text for Life platform which reminds me through text messages to my phone when I am due for the next donation. I also feel appreciated and encouraged when I receive a “Thankyou” message thanking me after donation. “Happy birthday” messages makes me more elated. My husband has now appreciated the importance of donating blood and now accompanies me for the blood donation sessions and he has since become a regular donor. My 21 years old son has since become a regular blood donor since when he attained the age of 19. I have learnt that one needs to be healthy to ensure the safety of his or her blood. I have so far donated 53 times. I donate blood to give back to my community. I would urge all, men and women to ask themselves, “What did I do for my community”? distinguished guests and all protocol observed, before you is Tabitha Muthoni. baby boy prematurely at 7months. medically fit to come out and donate blood to save a mother and to save a life. and aggressive as they carry out their duties to help save lives. to all donation centers so as to make their work easier in saving lives. Without blood there would be no life. husband for being there for me at all times. My two sons, you are my strength. God bless Kenya and all donors. As for today my Hemoglobin level stands at 7.0gms. Still we need you donors. gone through disease challenges and the challenges ended with many transfusions.